In future, lung diseases will be a challenge for the word-wide health system. The lung as a sensitive organ is more affected by degenerative aging processes and environmental pollution than other human organs. Thus, the acquisition of respiratory dynamics is of high interest and will be even more important in future, not only for the treatment of patients with lung diseases. Continuous recording respiratory parameters like the tidal volume would be helpful in different areas of application, e.g. the monitoring of sleep apnea or elderly people at home, but also for training optimization in athletes. "Wearable technologies" or "wearables" are a modern guideline for clothing with different embedded sensors. 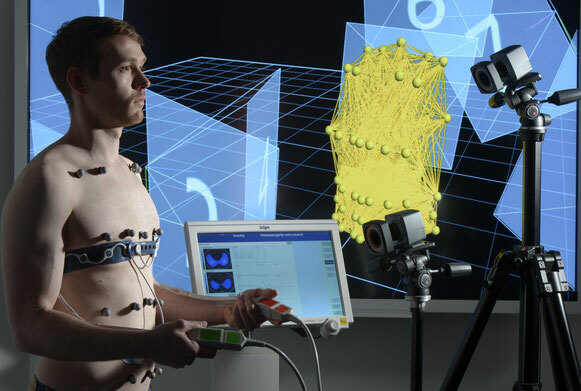 A wearable shirt, which can continously measure respiratory parameters like the tidal volume will be a system to sustain the lung functionality longer and so the quality of life. The monitoring of these respiratory parameters in combination with cardiac and circulatory parameters will be an innovative control system, which will show benefits in many different applications.